When you check out your competition’s Web site, it’s useful to know what keywords they are using, as well as how often they use these keywords. A page analyzer is an excellent tool for doing this. A page analyzer measures as a percentage how much your keyword is used compared to the total number of words on your Web page. The free page analyzer in the above figure is available from the SEOToolset Web site; it measures the frequency and prominence of keywords and graphs their density. 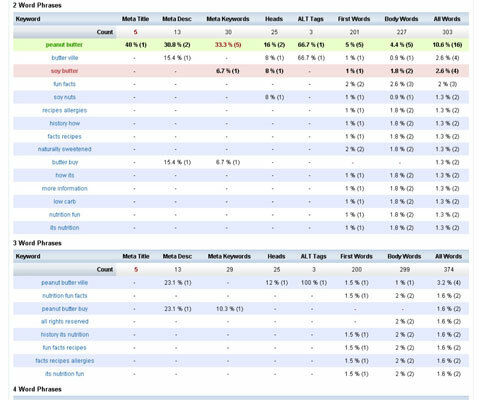 Using a page analyzer allows you to keep track of your competition in order to see what the search engines prefer and why. You should also keep track of the results by using a spreadsheet program. This is something you should do periodically in order to keep track of the progress of your competition. To use the page analyzer mentioned here, simply type your Web site’s URL into the query window on the above Web page, and click the Check Keyword Densities button. 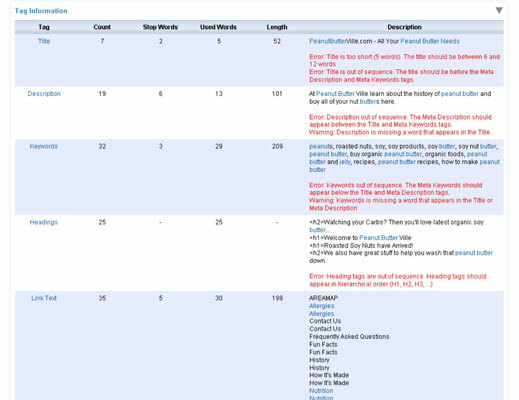 After a minute, you see a results page like the one shown below for a training site, www.peanutbutterville.com. As you look down the report, the items in red indicate that your keyword density may be too low to rank across all engines. The items in blue indicate that your keyword density may be too high to rank across all engines. The first thing you’re going to see after you’ve placed your Web page into the page analyzer is your Google PageRank (the algorithm Google uses to measure and assign importance and weight to the links in your page and the links to you). Peanutbutterville.com has a PageRank of zero because of a lack of inbound links. In the above figure, you can see that you’re next given a list of common words on your site. These are the keywords the page analyzer found on your Web page. A page analyzer (and a search engine) considers a word a keyword if it is used more than twice, including in keyword phrases. In a full version of the toolset, you can actually enter in the keywords from your list and the page analyzer measures them and provides you their stats. In the above figure, under the headings “Title Tag,” “Meta Description Tag,” and “Meta Keywords Tag,” you can see all of the text the page analyzer found in your Title tag and Meta tags for this page. Title tags are what you name your Web pages in the HTML coding of the site. It’s very important to place a keyword or keywords in your page titles. The Meta description and keywords tags are other items in the HTML code at the top of each page. These are not visible to the user, but search engine spiders read them and measure them as part of your keyword density. 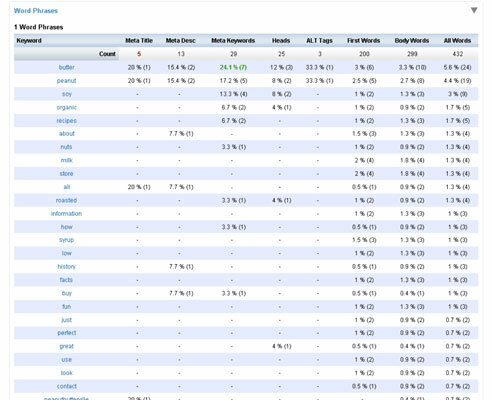 A page analyzer shows statistics for every keyword. The page analyzer can let you know if a title is too long or too short, whether too many keywords are used or not enough, and whether you’re in danger of a spam violation. The above figure shows the stats page. This lists every word or phrase that’s used at least twice on your Web page. The columns also indicate where your keywords appear in your page, and how many times the keyword is used in that particular section. For instance, in the above figure, the word butter is used once in the Title tag and ten times in the body text of the page. It also tells you what percentage out of the total amount of words the keyword accounts for. The page analyzer also tells you by one-, two-, three-, and four-word phrases how your keywords are spread across your page. 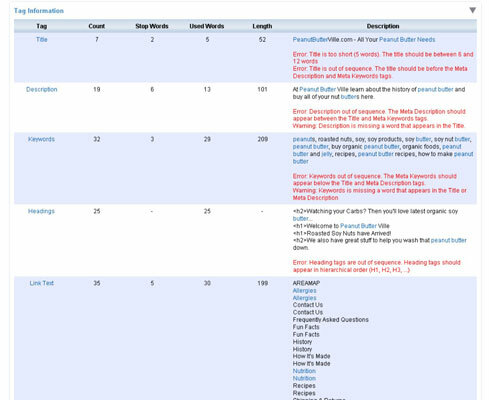 The above figure shows the page analyzer report for your keyword multi-word phrases. Densities on multi-word phrases are usually significantly lower than single words. Although a density of four or five percent might make sense for a single word, your multi-word phrases should be quite a bit lower than that (depending on your industry).